New Year, New Job. Next month I start a new job having been at my previous company for just over 10 years. It's an exciting time and something I'm really looking forward to. It's also made me reassess a few things and realise that the one of the rooms in my house is wasted as a bedroom. For 360 days a year, it's currently not used at all and I've realised that's ridiculous so I'm turning it into a home office. I still want to be able to use it as a bedroom on the odd occasion I need a second guest room, so I'm now the proud owner of an inflatable double mattress. It's easy to blow-up as it's got a built-in pump so you just plug it in & it's ready to sleep on. Genius! It also means I can turn the room into a home office which will be so lovely & a far better use of the space. I will be able to do all my blog writing in there as well as working from home in the most productive environment. The added bonus is it's also an opportunity to give the room a bit of a makeover! Cue mood boards & lots of Pinteresting. I want the room to be clean & fresh but have some warmth to it as well so it's not too clinical. I love Kate La Vie's style and her home is 'house goals' so I'm drawing inspiration from that when it comes to the design in my office. There's a chimney breast in the room so I'm thinking a feature wall with either wallpaper or a different colour. I love Juliet Travers designs and House Anna is about to bring out some lovely designs too so I'm keeping my eye out for when they land. 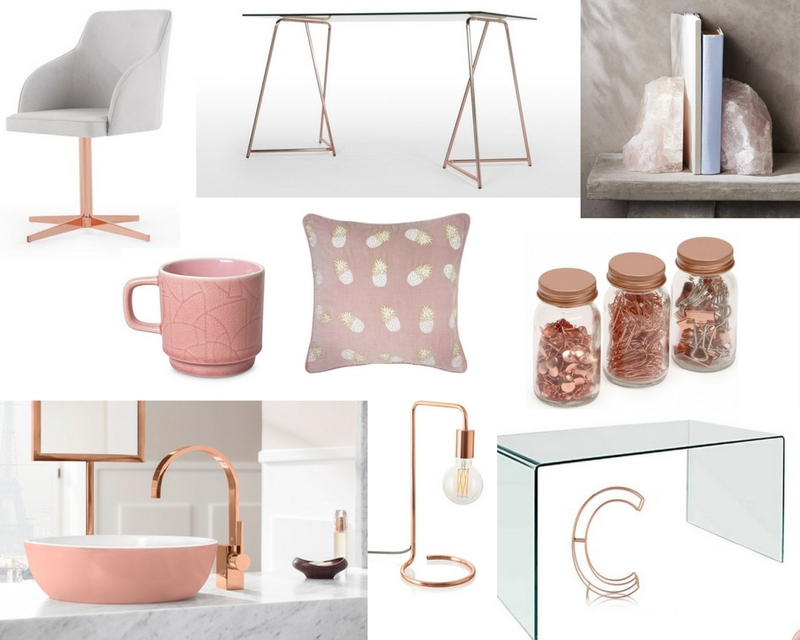 Rose Gold & Copper are colours I love as they add warmth and a different texture to the room with the metallic shine they bring. The room is not huge, so I want to make sure to use glass in the room to give a real feeling of space. Although I've seen some gorgeous desks, I'm thinking something glass would be best as it reflects the light ad, from a practical point of view, it's easy to clean and won't be marked by mugs of tea or spills from my clumsy tendencies. White Marble will also a great job of reflecting light and adds a nice weight to things. I love that every piece of marble is different and bringing some natural materials to the space will add a nice feel. Thanks for reading, and if you have any products you think I should check out for my office do let me know.